Released: July 7, 2012. Muad'Dib's expanded new version of the acclaimed original 7/7 Ripple Effect. Please share this film with everyone, because the organized criminals behind the 7/7 2005 terrorist-attacks are not going to stop, until enough people wake up, and decide to do what is necessary to stop them. You can buy a copy from Richplanet.net for £12 plus postage. It is recommended to use a download-addon like 'DownThemAll!' for Firefox, which will allow you to resume the download if you lose connection before downloading is complete. If you're able to provide hosting and mirroring, please let us know. Thank-you. How-to burn the ISO image onto a blank DVD on Mac OS X: instructions. As a result of his good-will, Muad’Dib’s home was raided by police and he was arrested on a charge of "attempting to pervert the course of justice". In the Orwellian 21st century, he was really just being attacked by a malicious and out of control police-state for getting in the way of their mass-murderous crimes (7/7 was an event of mass-murder). The charge against Muad’Dib originated out of the filthy-corrupt Westminster (political) court in London, right next to where the globalist banking syndicate is headquartered. Muad’Dib then spent over a year and a half fighting extradition to England where he knew it was going to be one corrupt event after another. The very short story is that Muad'Dib's court-appointed lawyer in Ireland flatly refused to do as instructed and sabotaged any successful defense. Since the other Irish judges were all quite corrupt too, never applying Law, or even the relevant legislation, Muad’Dib’s fight against extradition was eventually denied by the Irish Supreme Court in front of 40 supporters and he was re-imprisoned, then taken to the UK by "counter terrorist" police in November of 2010. Once there, the more obvious corruption started, as Muad'Dib was at that point held firmly in the clutches of a filthy corrupt British Establishment (including police, courts, and media). Firstly, Muad’Dib was deleted from the prison’s computer system, with them originally saying that Muad’Dib wasn’t even at their prison and they didn’t know where he was (lies). About that same time, a police officer(?) working to prosecute Muad’Dib stated openly that many other people sent DVDs to the same courthouse as Muad’Dib, but no one else was even investigated, never-mind charged. This was an open admission of a malicious and politically motivated prosecution/persecution. Eventually the prison system was forced to admit they had Muad’Dib in custody, and a bail application was made, in front of yet another corrupt judge, who had the courtroom closed to the public before denying bail with the official reason that the judge(?) “didn’t want more DVDs to be sent out”. Sending out DVDs is, obviously, not actually a crime. Muad’Dib then spent approximately four months straight, incarcerated, teaching and waking up a sizeable portion of the prison staff and inmates who ALL knew that he did not in any way belong in prison. In early March of 2011, bail was finally granted by the only judge throughout this entire process that actually seemed like a reasonably honest man. However, this process was still made very difficult by the fact that the prison service kept making “mistakes” or “forgetting” to bring Muad’Dib to his own court hearings. In all, Muad’Dib was only produced for two of seven different court hearings whilst in (police-)state custody. After being granted bail, one of Muad’Dib’s supporters went to go pay the ransom money, only to find out that, once again, any reference to Muad'Dib had been deleted from the court's computer systems. This of course complicated things, but eventually the sabotaged system was worked around, the ransom money was paid, and after a bit of haggling with the prison, Muad’Dib was released with barely enough time to travel to his bail address before his court-imposed 10pm nightly curfew. At that point Muad’Dib began refining his defense and legal challenges. His first action was to challenge the jurisdiction of the court, by proving, with a wealth of evidence, that “queen” Elizabeth is not the rightful monarch, and never was. This was a two-point argument. First, that Elizabeth knew—both then and now—that she was crowned on a fake coronation stone instead of the real Stone of Destiny/Coronation Stone, which meant not only was she never properly crowned, but she was also knowingly and fraudulently conning the public, and that is why she didn't want her coronation televised. 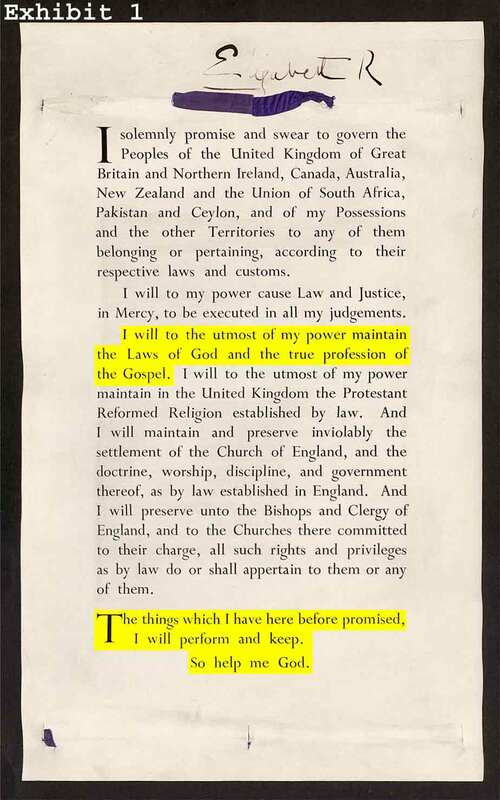 The second and absolutely irrefutable part of the arguement, is that Elizabeth had broken her legally binding coronation oath, which is a valid contract she made with the British people allowing her to be their queen. Although more proof exists and was to be used in court, the skeleton legal argument summarizing this jurisdictional challenge can be found online at: REGINA v JAH. At the end of March 2011, Muad’Dib submitted the basics of this challenge to the court, alongside applications to subpoena “queen” Elizabeth to testify, and also for production of the Sovereign’s Coronation Bible, which Elizabeth had used when swearing her legally binding oath. Elizabeth also signed a written version of the contract, and a high-quality picture of the original can be seen here: Signed Coronation Contract. Unsurprisingly, nothing at all was heard back from the court, unlike what would normally happen. So, on the final working day before his May 9th trial, Muad’Dib visited the court clerk’s office, and asked them what the situation was. At that point, he was finally notified that his subpoena applications had been denied (by an extremely dirty judge), but that the court had, once again, “mistakenly” mailed that information to the wrong address. After having been harassed, monitored, restricted, and imprisoned for long periods of time by a completely rotten “judicial system”, May 9th 2011 finally came, and with it, as one would guess, more corruption. The judge, hand-picked by the Establishment to handle Muad’Dib’s case, was clearly unhappy to have been forced into what he surely saw as a difficult predicament for him. He had a totally innocent man (Muad’Dib) in front of him, and a courtroom full of witnesses which were going to make it very hard for this judge to carry out the orders he’d been given by his evil puppet-masters, which was to make absolutely sure a guilty verdict was returned against Muad’Dib. First, the judge flatly refused to hear Muad’Dib’s application to subpoena Elizabeth and the Coronation Bible. With that brushed aside, he then read Muad’Dib’s jurisdictional challenge, or at least said he did, which, as above, had/has two points: a) the fake stone used, and b) the broken coronation contract. After giving Muad’Dib a few minutes to make his case, the judge adjourned the court for the rest of the day. The following morning he came back and said he was denying Muad’Dib’s challenge, ONLY on the grounds that it “didn’t matter” if a fake coronation stone was used. The judge very slyly attempted to ignore a huge amount of Muad’Dib’s challenge, saying absolutely nothing whatsoever about Elizabeth having broken her legally binding contract with the British people. The judge had to ignore and bypass that part of the challenge, because, even by their own silly “rules” and legislation, that part of the challenge is still absolutely water-tight and irrefutable, being very simple contract Law. The fact that the judge refused to even mention that crucial part of Muad’Dib’s challenge offers a great deal of proof that it cannot be argued against in court, therefore, everyone should be studying the information and using it themselves in any British (or Commonwealth) courtroom possible. If you’ve not broken a Biblical Law, then you cannot be prosecuted for anything by Elizabeth or her agents acting on her behalf. With Muad’Dib’s challenge officially denied (ran roughshod over as he predicted), the jury was then sworn in, and the prosecution began spewing out a bunch of pointless hot air. Basically, the prosecutor (who was an arrogant, rotten little girl with no moral decency whatsoever--which is why she was picked for the job) had absolutely no legitimate case to argue on behalf of those evil Establishment figures controlling her, and they ALL knew it. So, she just talked around in circles for the better part of a, day, while some members of the public and jury struggled to stay awake. Once that had finished, Muad’Dib’s only defense was getting up on the witness-stand and explaining to the jury that he sent the DVDs to the courthouse because innocent men were being maliciously prosecuted, just like he now was, and that he could not sit back and watch people go to prison for something they didn’t do. It really was that simple, so, Muad’Dib then used the opportunity to also enlighten everyone in the courtroom about other subjects like the false-flag 911. Upon cross-examination, the aforementioned rotten little girl prosecuting wasted everyone’s time by connivingly trying to get Muad’Dib to say he’d done something wrong. That obviously didn’t work and she ended up hurting her own case even more, deciding she’d better sit down and be quiet when Muad’Dib scolded her for wasting everyone’s time speaking nonsense and trying to argue that black is white, and white is black. Red in the face and embarassed, she sat down. After this, both sides summed up their cases. The prosecution slandered Muad’Dib and the defense team basically said this whole thing was horribly ridiculous. Then it was the corrupt (and probably free-masonic) judge’s turn to have the last word. This horror in a black dress went on to do everything he could possibly come up with to try and manipulate the jury into giving a guilty verdict. This judge re-defined the words in the charge, stated Muad’Dib said things that he never said, then outright lied to the jury by stating it was not up to him which evidence they heard, when he had already forbid various (important) pieces of evidence from being shown to the jury (thereby making direct decisions about the evidence being heard). He did basically everything he could to have Muad’Dib found guilty, just short of openly telling the jury that they must convict. Had the public gallery not been full and over-flowing, he probably would have done just that. The jury then went back to deliberate and about 2 and a half hours later came back saying they couldn’t reach a unanimous decision (possibly a plant in the jury). The judge probably thought the odds were in favor of a conviction, so he then allowed a majority verdict (no less than 10 to 2 either way), and the jury went out again, before coming back an hour later saying they’d made a decision. The jury forewoman that gave their verdict came in the room beaming with a wonderful smile, and a few other jury members were definitely grinning. A NOT GUILTY verdict was then given and the jury left the room a final time to the applause and gratitude of the public gallery. The judge then quickly left the courtroom quite visibly upset (knowing he was probably in trouble for failing to get this conviction on behalf of his masters) and the prosecutor waddled away back to whatever crypt she’d crawled out of. The police officer visibly heading-up Muad’Dib’s prosecution actually had the decency to say he was sorry—which was nice, all things considered. However only days later proved he really is a dirty cop and a two-faced establishment shill. Muad’Dib is once again at complete liberty after having proven that doing the right thing always pays off in the end—IF you don’t lose strength. Yes, case closed… But a new beginning of sorts is upon us. Keep checking back for updates. This is just a battle won, but this war for Truth, Justice, and Liberty is not over yet. The purpose of this website is to serve as the official outlet for news regarding Muad’Dib’s arrest and trial, and also to appeal for your participation in putting another nail in the coffin of the so-called N.W.O. which only Muad’Dib (on Earth) knows how to defeat forever. In these troubled day’s we live in, with so much tyranny and deception thrust upon all of us, it is no wonder there are so many doubts and unanswered questions created for so many of us who are forced down this narrow crooked path that seems to have no light or end. The long crooked path that drains ones soul of the ‘joy, peace, love, hope, serenity, humility, kindness, benevolence, empathy, generosity, truth, compassion and faith’ that we were all born with. It is this crooked path of life that slowly but surely depletes the soul of these virtues given as a gift to us all and replaces them with ‘anger, envy, jealousy, sorrow, regret, greed, arrogance, self-pity, guilt, resentment, inferiority, lies, false pride, superiority, and ego’ etc. etc. It is no wonder so many cannot hear or see, yes some may say; I have ears and eyes. But in reality do they hear and see? This is the question we all need to ask ourselves. But there will always be day and night, good and evil. 13/01/2012 - Brizer, of TNS Radio, Ireland, chats to guest Muad'Dib along with Dee Kelly and Avalon Sakti, about The Ark of The Covenant and other subjects. News item: London 7/7 bombers 'were innocent patsies'. 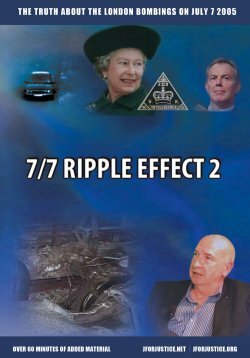 Unfortunately the actual name of the film, '7/7 Ripple Effect' was not included, but hopefully more people will now re-examine what they believe happened on that day. A serious and complete re-examination of ALL the evidence is absolutely necessary and it is becoming more and more clear to people every day. Please help continue spreading the word. Now, there are quite a few things wrong and disturbing about this. First, the name “Darcia” is almost boring, since we all know these Satanists love their childish symbolism. The name Darcy/Darcie means, “Dark one”, or “Of the dark”, and Darcia is just a derivative of that. John Anthony Hill: The 7/7 Ripple Effects Begin: Bring Down Queen Elizabeth & The New World Order! The TRUTH about the British Monarchy; the “Golden Jubilee” (50 year reign) of the queen who never was and The GOSPEL of The Kingdom. The word British is Hebrew and it means “Covenant Man” or the “People of The Covenant“, as it does also in the Welsh language. Elizabeth Mountbatten, also known by the aliases Elizabeth Windsor and Elizabeth the Second, who has never officially been crowned, because she was crowned sitting upon a fake Stone of Destiny, is, like all of her predecessors, from the royal line of king David of Israel and the British Throne is the Throne of David that is to be inherited by Christ, during the Second-Coming, very soon according to Nostradamus. Rescuciter le grand Roi d’Angoulmois. Before (warning) after war (Armageddon) reigns in good (God’s) time – (the Seventh i.e. the Sabbath Millennium – the third millennium A.D.). 17:16 But he shall not multiply horses to himself, nor cause the people to return to Egypt (slavery – employees under man-made laws), to the end that he should multiply horses: forasmuch as the “I AM” hath said unto you, Ye shall henceforth return no more that way. 17:20 That his heart be not lifted up above his brethren, and that he turn not aside from the Commandment (Covenant), [to] the right hand (right-wing politics), or [to] the left (left-wing politics): to the end that he may prolong [his] days in his kingdom, he, and his children, in the midst of Israel. Since being released, Muad'Dib has been invited onto a number of different radio shows this coming week to talk about the latest events. A program with Kevin Barrett is scheduled to be broadcast live this Wednesday, the 16th of March 2011, between 2-3P US Central Time on American Freedom Radio at http://www.americanfreedomradio.com/. There is a "Listen Live" button at the top left corner in the blue stripe just below the banner. Program schedules may be found at the "Radio Schedule" button right next to the "Listen Live" button. Kevin Barrett's show "Truth Jihad" is scheduled to air from 1-3P CDT, so it should be during the second hour of his two-hour program that he will be interviewing Muad'Dib. Another program with Jim Fetzer is scheduled to air Friday, the 18th of March between 5-7P US Central Time on the Revere Radio Network at http://revereradio.net/. There is a "Now Playing" box at the top right-hand portion of the opening page, located just below the banner, which should have the name of the program in it at that time. So, those wishing to tune in would simply click on "The Real Deal" with Jim Fetzer in the "Now Playing" box and begin receiving the feed. Any additional interviews will be posted on this website, and entries will be updated with archived files when available. It required spending over three months of constant effort to get Muad’Dib bailed out of a prison system that absolutely did not want to let Him go—but we’ve finally managed. “One cannot go against the Word of God.” – Dune. Since arrival in Britain, Muad’Dib has only been produced for two of His seven different crown court hearings, which obviously complicated things for Him, exactly as planned by the corrupt people behind His prosecution. Eventually, those hoping to silence Muad’Dib could not hold Him in prison any longer without looking totally malicious and ridiculous. So the State prosecution had to switch tactics, and end their fighting of a perfectly legitimate bail application, instead arguing for the most restrictive release possible so they could keep the closest watch possible on Muad’Dib whilst He was out on bail again. After various “mistakes” by the court and prison services resulting in a number of no-shows at court, Muad’Dib was eventually produced in front of the presiding judge and granted bail. To his credit, the judge that eventually granted bail has acted in a fair and respectful manner thus far. However, that still didn’t mean the State was going to let Muad’Dib go without additional fighting. After the judge granted bail, the following morning an attempt was made to pay the security/surety money in order to go ahead with the release. When arriving at the administrative building to make this payment, it was discovered that someone had gone into the court’s computer system and completely deleted any sign of Muad’Dib from their electronic records. After attempting every available search possible with the court clerk, there was nothing in their computer system showing that Muad’Dib even existed, never mind had actually been granted bail. With everything else that had happened to Muad’Dib (and some of His friends) since arriving in Britain, it wasn’t much of a surprise to find the computer system had been tampered with. Corruption is now the expected norm in Britain. Anyone who has dealt with State administrative workers will know that their help is not always of high quality, but some time and a bit of detective work later, one of Muad’Dib’s friends tracked down a copy of the necessary paperwork in another courthouse miles away where the bail application had been approved. Eventually, the required documents were produced in the location where they were actually needed, and the bail money had to be paid as cash, directly into the court’s bank account (have to wonder who has access to that money?). With the ransom money paid, the court clerks stated that Muad’Dib would then be released from captivity within a few hours. So at that point, a friend of Muad’Dib’s travelled to the prison and awaited His being set at liberty. Upon arrival to the prison, the next level of insanity was met. Will they bring Him to court this time? UPDATE:- No! THEY failed again! Update: Word has come back that the prison and court service failed to bring Muad'Dib to His own hearing, once again. This is now the third time He hasn’t been produced out of the four hearings He’s had. It is getting a bit ridiculous, but is also to be expected due to the proven corrupt nature of the “justice” system. It has been arranged in person with the court’s listing office and the prison service for Muad’Dib to finally be produced tomorrow, Tuesday the 8th of March. It will be the last chance offered to these people for them to do their basic jobs before much more active efforts are undertaken. This Monday the 7th of March, Muad’Dib is scheduled to be in court again. The hearing is yet another attempt to get a fair bail hearing for Muad’Dib. This will be the fourth bail hearing, NONE of which Muad’Dib has actually been present for. Twice now, the prison service has actually disobeyed direct orders from judges and failed or refused to produce Muad’Dib at court for His own hearings. It goes without saying that there is no guarantee they will do their job this time either. However, many people will now be watching in court, and from afar, keenly interested in how the circumstances play out. If the prison service continues failing to do one of their most basic duties of bringing people to court when required, a writ of Habeas Corpus will be issued, demanding that Muad’Dib be immediately produced in front of the High Court for those running the prison to explain their gross negligence. Let us all hope that such extreme measures are not necessary, but many people have become very suspicious that a 62-year-old British political prisoner is being held under very suspect circumstances and is not even being brought to His own court dates. To note, failing to bring a prisoner to court is by no means a common occurence with people accused of non-political crimes. So it is very difficult to see this having happened twice already with Muad'Dib, and shrug it off as a "coincidence". Given the nature of all political prosecutions, the State should be expected to act with the most extreme of care and caution, in order for the public to fully believe that there is no malicious intent. In all proceedings, but especially ones of a political nature, it is imperative that Justice is not only done, but it is seen as being fairly administered by the greater public, as well as the accused themselves. Time will tell, but if Muad’Dib is once again not produced for His own court hearing on Monday, the State will be shooting themselves in the foot, as a very loud and active public outcry will ensue.